The next morning I woke up and really did not feel like taking a run. Instead, we headed straight to Cafe du Monde. There was already a line a block long, but I went into the restaurant as instructed by our taxi driver, and viola, there were plenty of open tables inside. We polished off one order of three beignets and a couple of cafe au laits. Parkway Tavern for Po Boys. I know the others were a little skeptical, but as the place started filling up and the line started getting longer, I think they realized that there might be something here. I went for the surf and turf, roast beef and shrimp covered in house gravy. The roast beef was soft and almost shredded like a pulled pork, really a stewed rather than roasted beef, the shrimp was fresh and coated with a thing crispy breading – the best po boy I had tasted up to that point. I also tried a few of the fried oysters in H's sandwich, also great fresh oysters in a crispy, but not overwhelming batter. The sandwiches were dressed with gravy some lettuce and a tiny bit of mayo, I think they could've benefitted from some acidity, so I added some mustard. Both of them said it was a good call and I think that meant that they had low expectations. Cochon. The most modern place I'd been to in New Orleans. Ikea style, lots of light colored hard wood. We started with cucumber spicy pickles, wood fired oyster roast and fried boudin with pickled peppers. The cucumber spicy pickles were very korean, the wood fired oysters were absolutely delicious, oysters baked on the half shell in a wonderful spicy sauce – I could've eaten many more of these. The fried boudin was also excellent better than what we had at boucherie, light crisp crust with a savory boudin mixture – not gamey at all. Next came the paneed pork cheeks with pickled green tomatoes, tender pork good flavor, though not particularly outstanding. The Louisiana cochon with turnips, cabbage and cracklins – was the most deeply flavored pig I'd had this trip. It was basically pulled pork formed into a cake, so juicy and just the right flavor. The cracklins added a nice crunch and were clearly housemade. Smothered greens had nice bits of bacon in them. Then we finished with the Pineapple upside down cake, which was a delicious carmelized shell surrounding a sweet tart pinapple cake accompanied by a lime sorbet. beautiful combo of flavors. The Lemon buttermilk pie was fine, nothing special, but o.k. Service was not very good, somewhat cold and it seemed that they were trying to rush us out of the restaurant despite the fact that there were many open tables and no one was waiting outside. They dropped the check on us, cleared the table and after we finished dessert and were relaxing and talking with each other they began to wipe and clean the table. The next morning we went for a run and stopped for a quick bite at Central Grocery. The muffaletta was fine, the giarinera was better than Frank's next door, but I think I'm just not a muffaletta girl. After we freshened up we headed for Casamento's for oysters. Wow really great raw with their mixture of cocktail, horseradish and lemon sauce. 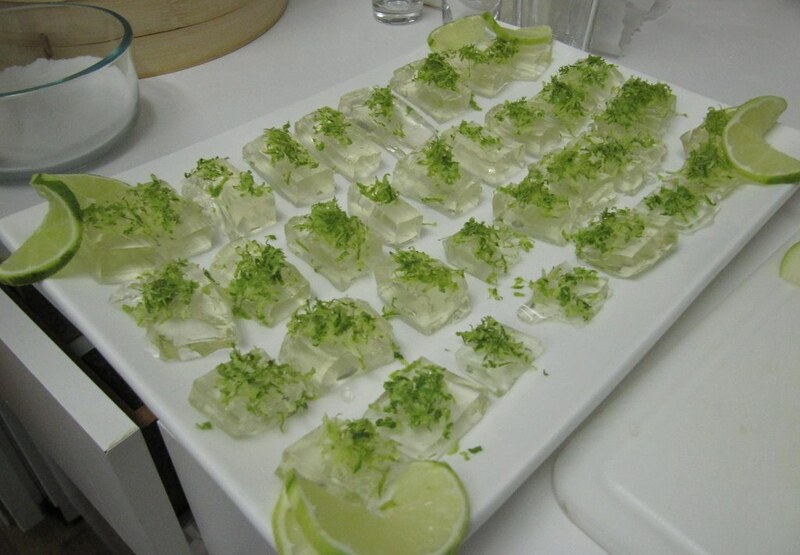 They had a very clean flavor (not briny at all) and almost burst in your mouth as you ate them. I'm not usually a fan of very large oysters because they are overly meaty. These oysters were large, but the flavor was light and refreshing. We also sampled their gumbo, oyster stew and oyster loaf. The oyster loaf was the best of the bunch, two toasted slices of texas toast style bread with a pile of freshly fried oysters on top. The oysters were really delicious, though I think the breading was thicker than I like. On to Lilette for lunch, we started with the chicken broth with poached egg, hmm, not really my favorite, too much celery and herb, this lacked flavor. The grilled beat salad with goat cheese and walnuts was delicious, I liked that the grilling added a char flavor to the beets and made them less sweet. Our mains were beef cheek and gnocchi in a mushroom bacon sauce. The mushroom sauce was nice, but the beef cheek was just o.k. while the gnocchi were dense chewy and just a little overwhelmingly starchy. The better of the two entrees was the pulled pork which came of toasted french breaded ladled with jus and mayonaise. Honestly, I thought that the jus soaked bread was the best part of the sandwich and for some reason the french fries were particularly good. Dessert was awesome. Quenelles of crème fraiche on top of lavender honey garnished with pistachios and poached pears – a winning combo of flavors and textures. Nutella custard with fleur de sel, caramel cream and chocolate-hazelnut brittle was good though a little on the custardy side. Then we walked around for a bit and ended up at Sucre and got some truffles. The next stop was Domilese's after a short train ride we came across this shack of a place. Domilise's – shrimp and oyster po boy was excellent. The shrimp had a nice snap and the oysters had a like crispy batter all of it went perfectly with the sauce. 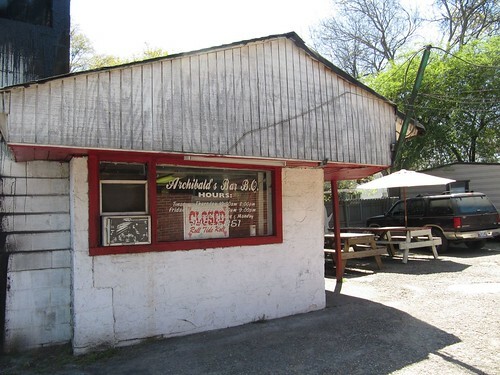 This and Parasol's were the most old school po'boy shops we went to. It was very hot that day and unfortunately they weren't running the a/c otherwise I'd rank this one as my favorite. Parasol's – roast beef po boy. The roast beef here is more like a long braised pot roast sandwich piled high with juicy tender chunks of beef, lettuce, cheese and a mayo sauce. I would've loved a glass of red wine to cut through the richness, but that wouldn't fit this place -- it's the back room of a neighborhood bar. This is my favorite roast beef sandwich. I can't believe it's almost been a half a year since my trip. I'm going to just post my notes. No time to write. Brunch at Commander's Palace. I completely understand why people rave about the service here. It is impeccable and the setting is very luxurious and traditional old school southern. Added to the setting was a foursome of debutants seated next to us wearing dresses and sitting with perfect posture and manners. The band is very smooth and professional, they've done this millions of times. The mood is festive and reminded me of an easter brunch with balloons tied down at each table. Now on to the food. We started with mimosas and a bloody mary, the bloody mary was strongly spiced and seasoned. I bit overwhelming for me. Ditto for the garlic bread starter, just overpoweringly garlickly. My dining companions loved it. We went on to the starters, two of us had gumbo while I had the absinthe dome oyster stew. Really delicious stew with an interesting flavor. Things were getting better after coming off on the wrong foot with the overpowering bloody and garlic bread. Next came Eggs cochon de lait with a pork debris gravy and mushrooms. This was excellent, the pork was tender well seasoned, smokey and one of the eggs was perfectly soft cooked, while the other was cooked until the yolk was no longer runny. The hollandaise sauce was very sparingly drizzled on top, but it was nice and lemony. I loved the pork debris gravy and mushrooms. This was a very good dish, save the one overcooked yolk. Dessert was strawberry short cake and a bread pudding souffle with whisky cream sauce. I enjoyed the bread pudding souffle, really a bread pudding topped wit souffle and then whisky sauce melting a hole through the center. Good flavor not overpowering and well balanced. We walked around a it in the Garden District on Magazine street and saw quite a few people munching on huge piles of boiled crawfish in the beer garden next to the Bulldog. H thought they probably got it from the seafood shop across the street. too bad I was so full. 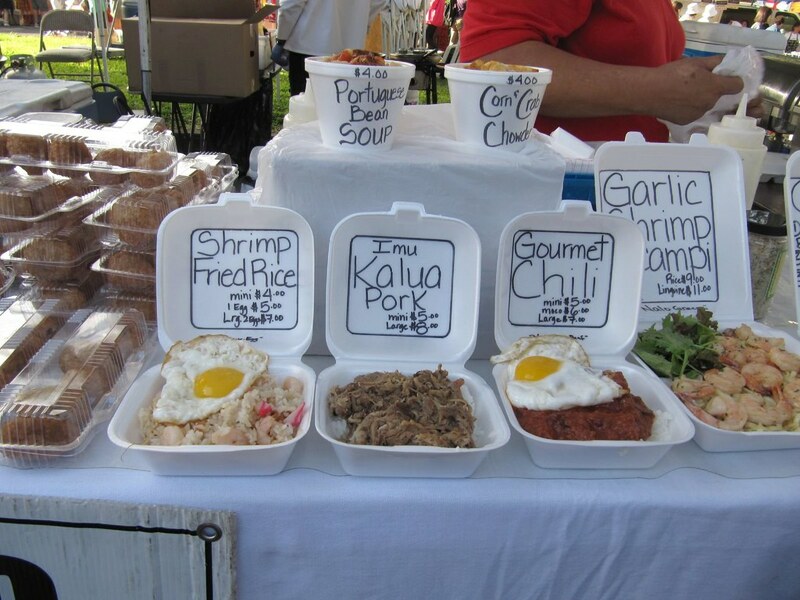 The Road Food Festival – I missed Lasyone's Meat Pies twice, they kept selling out! Anyhow, I tried pecan pie and a crawfish cake both were fine nothing outstanding. As I walked away, I saw a booth selling gumbo, chicken and sausage gumbo which I would normally pass up because it lacked any seafood. But I noticed that the restaurant Prejean's was from Lafayette, remembering that Lafeyette is in the center of cajun country, I thought I should give it a try as the style might be different than what I'd been having in NOLA, yet I was totally full, it was a small investment so I bought a bowl, thinking I'd eat a few bites to judge. It was thin not very stew like, slightly spicey, but not overwhelmingly so, full of flavor, no bitterness or interesting file flavor, really sort of clean and clear flavors coming through directly – a far cry from the somewhat muddied flavors from the other gumbos I'd eaten. In the broth was some rice, which was fine and there was nothing else, just the soup chicken and sausage and rice. Despite my full stomach I ate the whole thing. Then ran an errand and was thinking of going back for more. Alas it was too late and the festival was already in clean up mode. That night we wanted to eat light so we cancelled our reservation at Dante's Kitchen. Instead we went to have BBQ shrimp at Mr. B's. We tried a few other items unremarkable dishes and concluded that yes Mr. B's BBQ shrimp – with very fresh large head on shrimp was great, the highlight of the dish is the sauce – which for some reason reminded me of the gumbo from Prejeans! Anyhow it was very peppery spicy finished with cream and balanced with acid and a bbq sweetness – we sopped up the sauce until we finished our entire loaf of bread. We finished the night with a beignet from Cafe Du Monde. they were as good as I remembered them – crispy on the outside, airy on the inside with a good chew. This was our first full day in New Orleans. The road food festival was already in full swing but we decided to take a very long walk to Elizabeth's for brunch. Elizabeth's – This is an old style two story house in the Bywater neighborhood. The surrounding area is mostly residential so it's definitely had a neighborhood restaurant feel to it. The upstairs has high ceilings and a bar, while the down stairs has that crowded bustling feeling of a traditional breakfast diner. I had the fried green tomatoes, poached egg and hollandaise. The hollandaise was great, I wish there was more of it. R had the cajun breakfast which was a mix of pieces of smoked pork with shrimp on a slaw and a poached egg. I loved the smokey pieces of pork in her dish. 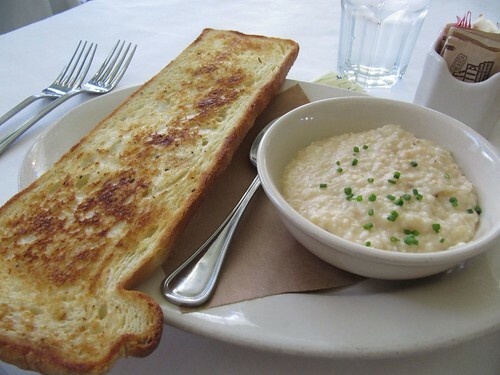 We each had a helping of grits, which were just normal grits. The service was excellent very casual and friendly. I'd definitely come back. The pralined bacon was fine, I imagine the excitement over it is more from the novelty of it before the candied bacon craze of the last few years. We lunched at Boucherie, a small place fairly far from the FQ. We were very happy with a bowl of crispy fries topped with garlic and parmesan accompanied by the house vinegar. Onto a bowl of mussels and collards, which was good, though not extraordinary. I did like the crunchy grit chips that came on top. Emeril's New Orleans was our first dinner in town. He has several restaurants in town and I was told that this was a good exemplar of the food he became known for. We started with the Rabbit on fried green tomatoes this was probably our favorite dish of the night. Delicious rabbit tender and flavorful, not the least bit gamey, on top of crispy fried green tomtoes. Just a beautifully balanced dish. Our second starter was the smoked exotic mushrooms on angel hair pasta with tasso sauce. The smokey mushrooms paired perfectly with the creamy tasso sauce which had a paprika and smoked ham flavor. Sometimes I find smokey dishes over smoked and so that the smokey taste overwhelms the rest of the components. The smokiness here was pitch perfect, though I think the noodles and the sauce could've been tossed together a bit more. Some ended up stuck together as a chunk, but the noodles that were well coated in the sauce were great. We went on to the seafood gumbo, which was a very good version of gumbo, not very spicy but really well balanced a lot of different flavors melded together, but not a soft of muddied overcooked taste that you sometimes get with gumbo. By the end of the week, I had sampled many gumbos and this one ranked among the best. Oysters, Frito Misto, Chicken Sous Vide – all well executed nothing suprising but good clean flavors and very good service. Seems like a popular after work hangout of professionals in the area. I would definitely return it’s farm to table style done well. Deceptively simple looking belying its sophistication. Birmingham, Alabama. 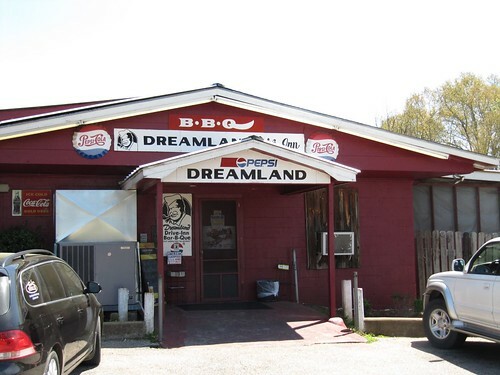 Dreamland - ribs had nice char on the outside and were moist but the meat was chewy, not tender. The meat was really grey in color and flavorless other than the sauce. 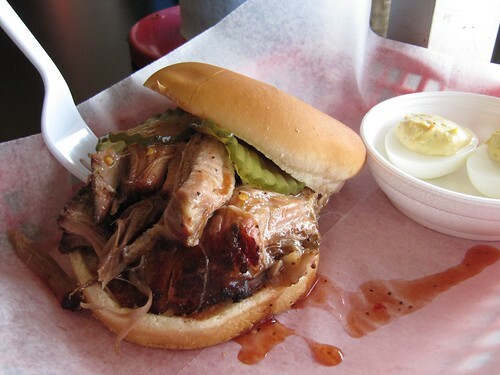 The pulled pork is moist succulent and has a very subtle jus, though a little underseasoned to my tastes. Archibald's half rack of ribs was much better than what I had at Dreamland. More tender, but still chewy good char on the outside, I liked the sauce better than Dreamland, but overall just ok. I made a stop at the Waysider in Tuscaloosa for a quick breakfast. 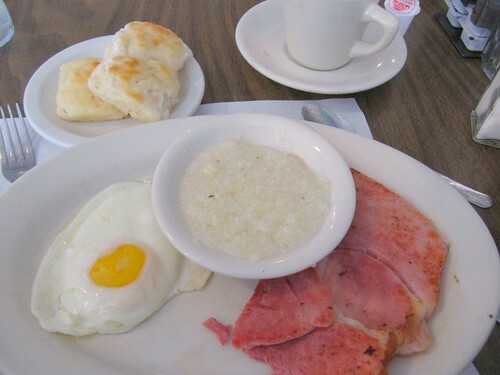 This place is old school a real glimpse of traditional breakfasts like a fried egg, country ham with red eye gravy, grits, biscuits and friendly service. 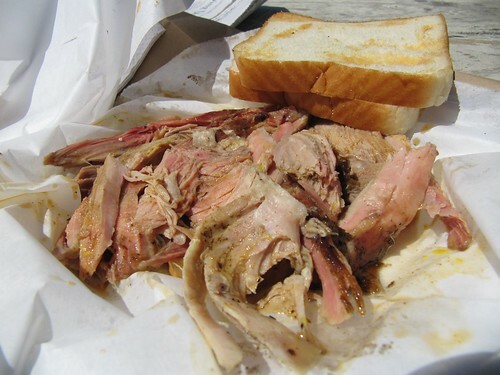 Saw's BBQ - I had the pulled pork and the smoked chicken sandwich with white sauce. I loved the chicken sandwich. 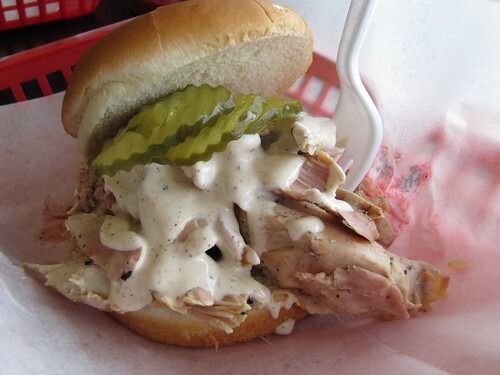 Juicy pulled chicken with a nice Alabama style horseradish cream sauce. The pork was my favorite of the three in ham, nice sauce good balance of tenderness and smokey charred exterior. Homewood, Alabama. Bright Star - this place is like walking into a time machine. The service was incredibly friendly and eager to please. Recognizing my interest in the menu, they comped me a seafood gumbo. The place was very busy at lunch. The food is all pre cooked then brought out to the diners, who looked like regulars. I had the fried snapper throats, rice and spinach casserole, sweet corn and a tossed green salad. I could not get over the 70's decore. It looks like none of the furniture has been changed for the entire time they've been open. The snapper throats were fine, obviously fresh and very crispy crunchy exterior, flour based crust. I really liked the sweet corn which tiny little pearls of corn, they must've been boosted with a bit of sugar. Martin's - I was just too full to do a meat and three. I had the fried chicken which I thought was very good. No fancy seasonings, just very straightforward fried chicken -- juicy and super crispy crunchy exterior that held up really well as you bit into it. Montgomery, Alabama. On the way to Atlanta, I stopped at a highway side farm-stand-peach-emporium called Peach Park. 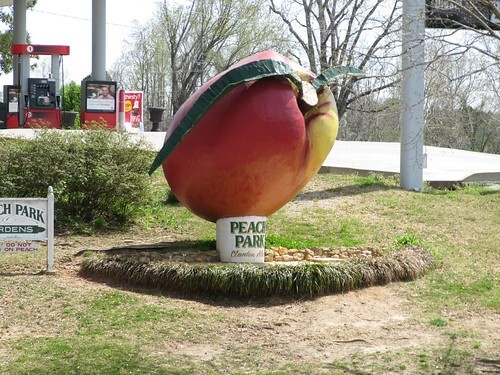 They had peach pie, peach ice cream, peach cobbler, and rocking chairs where you could sit and enjoy your peach ice cream topped peach pie and gaze at a peach statue. 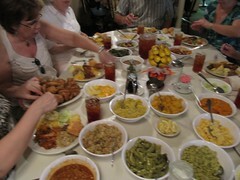 Mrs. Wilke's Kitchen – it's a smorgasbord of low country cooking and comfort food. Everything is good, but there are just so many little tastes it's a bit overwhelming and difficult to get the full effect of any single item. If there weren't such long lines I would love to eat here and just have chicken and two or three sides to get a complete taste. The experience of sitting at a large table with others is good fun. Sat next to a retired mother of two super friendly woman from Michigan who loves her daughters and loves to visit historic areas. Good fried chicken. Just way too much food. Also had a shrimp and grits at a place on the waterfront not very good, the shrimp were very small and grilled had o.k. flavor but the grits were somewhat lumpy and dry and the tasso gravy was thick and heavy – I think it was probably a good example of the dish, I just prefer the versions in NOLA. I should've known better than to stop at a place right on the touristy waterfront. My favorite BBQ of the trip. I'm not usually one that goes for a sweet style sauce, but the ribs at Fresh air were juicy, tender without being mushy and the vinegar sauce glazed the meat providing a nice balance of flavors. The place is just off the highway in a non descript strip mall. Not exactly the sort of bbq shack I imagined but definitely the bbq itself was what I’d been hoping to find during this trip. Macon, Georgia. After having such wonderful BBQ at the Macon branch of Fresh Air, I thought I'd swing by the Flovilla (original) branch of the restaurant. It was as described in a shack on the side of the Gray Hwy (an interesting two lane country road) – driving down that road made me sing Country Road Take me home because that really was what I picture when I hear that song. The Fresh Air in Flovilla was a disappointment. No ribs -- all they had was chopped pork bbq and brunswick stew. The brunswick stew was pretty good, better than a lot of other places and the sauce on the chopped pork was tasty, though I really wished I had just gone back to the branch in Macon. The more I ate the stew the more I liked it. I realize it's the sauce mixed into the stew that has the flavor. Flovilla, Georgia. 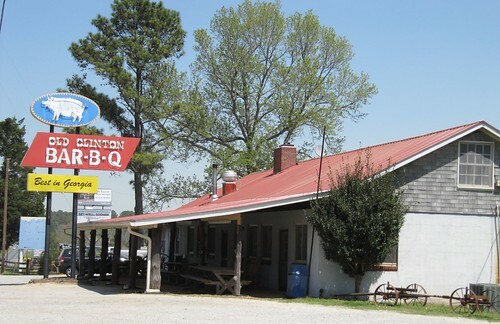 I also stopped over at Old Clinton BBQ – a shack of a place with a lot of history. The young women working in the shack are so nice, unfortunately the ribs though nicely charred on the outside, had little flavor. I suspect they just didn’t have enough turnover. 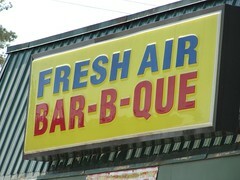 Finally returning back to Atlanta I stopped at Fox Bros BBQ. Hooray! Gabriele my server chatted with me about my trip and wanted me to enjoy Atlanta, she recommended a two way platter with ribs and chicken wings. The wings aren't something I'd normally order, but she was right. 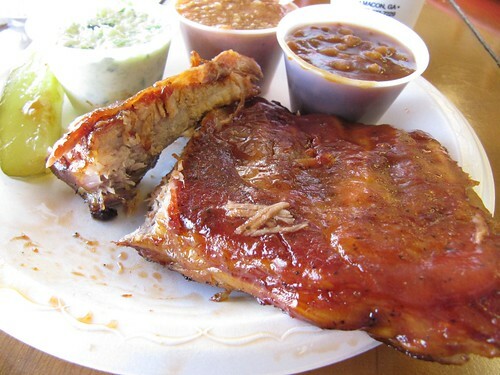 In fact, they were better than the ribs – tender smokey well seasoned. 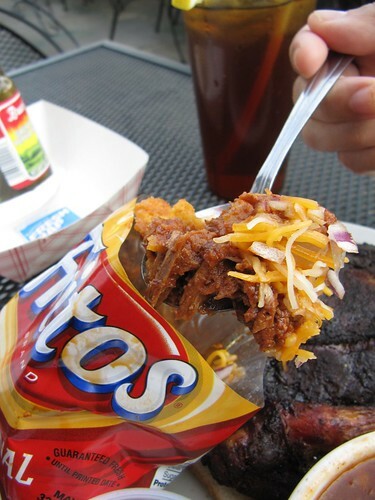 The sides were also excellent: Frito Pie served in the bag. She mentioned that it isn’t that common to get frito pie served that way anymore. She grew up an hour south of Atlanta and she used to have it at the school cafeteria growing up. Definitely not an Alice Waters approved school lunch. The other side dish was Fox-o-roni – a mac n cheese covered with brunswick stew. Also very good. I'm tempted to go back just for the sides! The ribs were fine, really bbq'ed smoked with a nice bark on the outside. Just not as flavorful as I like, they needed the bbq sauce to provide all the interest. I hit a few more spots in Atlanta including Abbatoir which I enjoyed very much. I would put it at the top of my list for places to return to everything we had was good to excellent, though unfortunately I can’t recall all the details now. I also sampled a few donuts from Sublime Donuts. 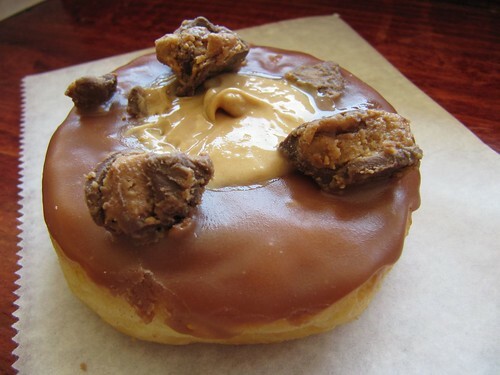 They had some creative ones including a Reese’s Peanut Butter cup donut. The donuts themselves were very standard bland type which worked well as a canvas for the peanut butter filling and chocolate added to the top. I had a memorable meal at Watershed Restaurant, this was a must do even though Scott Peacock was no longer the chef. After having great luck cooking from The Gift of Southern Cooking the book he wrote with Edna Lewis, I had to try the fried chicken. I started with the shrimp grits on a pullman's plank, which was a delicious bowl of shrimp mixed with grits into a creamy topping for a loaf long cut of toast. I would order this again and will try to reproduce it at home. 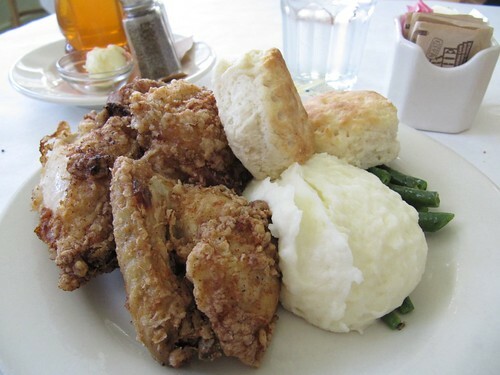 The fried chicken was exactly as I expected, juicy, tender well seasoned, - a very good example of fried chicken served with light biscuits some smooth mashed potatoes and nicely cooked green beans. I ended the meal with the "Very Good Chocolate Cake". The cake is perfect, simple, straightforward no unnecessary elements, just extremely moist cake with a great chocolate icing. Daddy D’s and Ria’s Blue Bird, both near the big cemetery – I thought the food was fine, both places have a lot of character but not noteworthy from a culinary perspective. I also gave Woodfire Grill a try. I admit I was curious based upon watching Kevin, the bearded chef on TV. I wish I had some positive things to say about the food, most of the dishes just didn’t work. Though a lot of it looked good on the plate, so many of the dishes didn’t come together. Even L thought that it was not very good. This Spring some friends invited me to join them for a culinary tour of New Orleans. I was excited about eating in New Orleans, but my research for the trip got me thinking about the whole state of Louisiana and the rest of the South. After so many years of international travel, it was high time I got to know places closer to home. I decided to extend my visit into a road trip through Louisiana, Alabama and Georgia. Having spent most of my years on the East and West coasts, I thought of the South as the real America, somewhere I might find the real fried chicken, grits, biscuits, collard greens, bbq and other dishes that we call comfort foods -- the original versions rather than adaptations of these dishes brought to big cities by transplants or enterprising hipter gourmets. Probably because I watched too many reruns of the Andy Griffiths show, I had a vague notion that I’d find sweet Aunt Bee cooking up some incredible fried chicken and baking pies at a roadside diner. I though I might get lucky and find some small town with interesting characters or befriend a fellow diner at lunch counter who would direct me some out of the way bbq shack. Another side of me feared being stopped on some backroad by a corrupt sherrif trying to ticket outsiders. Basically, I had no credible information and no real clue what to expect. Aware of my complete ignorance, I was ready for an adventure to enlighten myself about Southern culture and more importantly, eat some good food. In preparation for my trip to the South, HM arranged a training session at Bruno's. I hadn't been in years and was interested to see what the new chefs had done with the place. Upon entering I noticed that it is still a bar, most of the seating is the same, though I think some of the high backed booths have been removed. It's comfortable place for a drink, but what about the food? Mac n Cheese – this was fine, but even better were the grilled asparagus with pork belly and a soft cooked egg. The asparagus was well seasoned and grilled to a smokey tenderness, the soft cooked egg had a runny yolk and the pork belly, good execution of a tried and true combination. Onto the main courses. Oyster Po'Boy, if they served these at lunch, I would come regularly. Crispy cornmeal coated oysters on good french bread with a spicy bright slaw – very good, also thought that the bread on the sandwich was exactly right (airy and toasted) staying out of the way of the rest of the flavors. The chicken fried steak had a crispy outer coating flecked with herbs – I'm not a chicken fried steak person, but I liked it. Our friend from Louisiana proclaimed that it might be the best chicken fried steak he'd ever had. Finally, the bbq pork ribs, now I have been a regular at Memphis Minnie's for some time, and for some reason my last few visits were not as good as before (the brisket has been a bit oversteamed from sitting too long). I suspect that turnover at real bbq joints is as important as it is for sushi places. Luckily, I now have a new place to go for ribs. Bruno's pork ribs were smokey tender, with a bit of chew. The bones were cleanly frenched and served with sauce on the side. They don't need the sauce, but the sauce is pretty good a South Carolina vinegar style of sauce. We got the ribs with spicy cheese grits on the side. The texture wasn't as smooth as expected, but the cheesy grits spiked with green chile flavor hit the spot. To top it all off it came with a beautiful, fluffy on the inside, crispy on top, biscuit served with honey butter on the side. We all agreed, these chefs know Southern food. We sampled all of the desserts that night. Churros, whoopie pie and some kind of toffee cracker that they called Crack. The toffee cracker crack was a matzo cracker sandwiched between two pieces of toffee and punctuated with a hit of sea salt. Toffee is fairly easy to make, but often the flavor balance is off, either it's too buttery or too sugary. This one was perfect and the matzo cracker in the middle was brilliant, a good way to emphasize the crispiness of the toffee and add an accompaniment to the sugar – and of course the sea salt added the right hit of salt at the end to bring out all the flavors. So far so good, and then came the churros. These were about five churros coated in cinnamon sugar, looking exactly like what you see in Spain. Wow, a crispy exterior crunch gave way to a soft moist interior – hands down the best churro I've eaten. I would return here just for these churros – (I would've also loved the nice little pot of chocolate to go with them). Then I moved on to the whoopie pie. It was what you'd expect, a orange whipped cream sandwiched between two soft airy pieces of “bun” made of chocolate cake. It tasted just fine, but I'm not completely sure because all of my senses were temporarily overloaded by the pleasure of the churro I had just had. The service was very friendly and welcoming. The chef came out of the kitchen several times to look at the tables. At the end of our meal he came over and checked on us. I love it when the kitchen is really intent on taking care of you with their food. I mean, not just satisfying you getting your order out and over with, but taking care of you and genuinely hoping that you enjoy their food. Unfortunately, the bar atmosphere and loud music at Bruno's does somewhat of an injustice to the kitchen by distracting from the food. On the bright side, this is seriously good comfort food. One of the better meals I've had this year, good enough to put up with the loud music. I'm looking forward to my next visit. Favorites: Churros, Churros, Churros, Ribs and spicy cheesy grits, oyster po boy, Toffee Cracker Crack, chicken fried steak.